Americans throw away about 40 percent of the food they buy. Horrifying, isn’t it? But there are many ways to reduce your food waste. You can shop more carefully, plan for leftovers and use every inch of food you buy. Previous generations were well acquainted with this last technique. Vegetable trimmings were saved for soup stock, onion skins became non-toxic dye, and unused animal fats were transformed into either soap or candles. While I’m not suggesting you start making cleaning solvents with your dinner leftovers, a good starting place is root-to-stem cookery. This means simply using the entirety of the vegetables you buy. With a little bit of know-how, beets transform a marinated salad, while the greens and stems are toasted into a crunchy chip. Acorn squash is cut into half-moons, and roasted with olive oil and maple syrup while you simmer and broil the seeds into a tasty snack. And pop those rainbow chard stems into a puckery brine, leaving the leaves to be sautéed and simmered into a creamy side dish. Using the whole vegetable doesn’t sound so bad, does it? 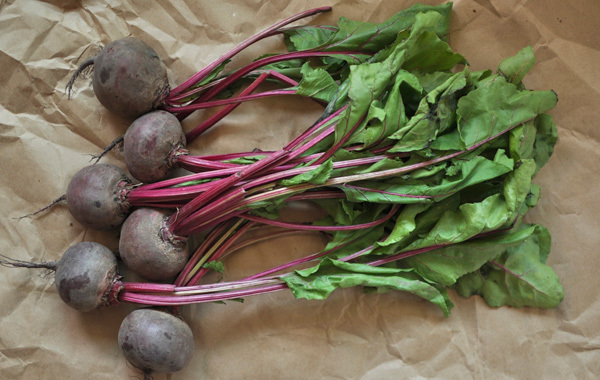 Look for beets that are firm, with fresh, leafy greens still attached. Wash beets well. Trim away remains of stems and scraggly root bits. Place beets in a medium saucepan and cover with cold water. Cover and place on stove over high heat. Bring water to a boil and then reduce to a simmer. Cook for 20 to 25 minutes, until the beets can be easily pierced with a fork. While beets cook, prepare the marinade. Combine remaining ingredients in a small jar with a tight-fitting lid. Shake to combine and set aside. When beets are tender, drain and cover with cold water. When they are cool enough to work with, gently rub away the skin. It should peel right off. Cut peeled beets into slices and place in a bowl. Cover with marinade and let sit for at least 30 minutes before serving. To serve, portion beets into bowls and top with crumbled goat cheese. Preheat oven to 425°. Line two rimmed sheet pans with Silpats or parchment paper. Trim beet greens into individual stalks. Wash and dry well. Spread clean, dry greens in a single layer across the two baking sheets. Drizzle with olive oil, salt and pepper. Roast one pan at a time for 5-7 minutes, until leaves are crisp, but not burnt. Serve immediately. When picking out chard, make sure to go for bunches that have sturdy, unwilted leaves and long stems. In a large, deep saucepan, melt the butter over medium-high heat. Add the washed chard (it’s okay if it’s still wet) and garlic to pan. Add in stages if necessary. Turn the chard in the pan with tongs until everything has a coating of butter and begins to wilt down. Add cream, cover and reduce heat. Let simmer until chard is tender. Remove lid and increase heat to medium-high. Cook until liquid has reduced. Taste to adjust seasonings and serve. Wash stems well. Trim ends and cut into two-inch long pieces. Set aside. Combine vinegar with sea salt and 1/2 cup water in a small saucepan. Bring to a boil. Put garlic cloves, mustard seeds and peppercorns in the jar. Pack chard stems into jar. Pour brine over top. Gently tap the bottom of the jar to loosen any air bubbles and add more brine if there’s room. Place lid on jar. Let chard stems sit on counter until cool. Once the jar has returned to room temperature, place in the refrigerator. Let stems marinate in brine for at least 48 hours before eating. Serve with cheese or chopped and stirred into tuna salad. Look for squash that feel heavy for their size. No need to peel; the skin on acorn squash is entirely edible. Preheat oven to 400°. Line a large, rimmed baking sheet with parchment paper to prevent maple syrup from burning on your pan. Wash squash well and cut in half. Scoop seeds and stringy flesh out and set aside. Trim away stem end and cut squash into half-moons of approximately a half-inch in width. Place squash slices in a large bowl and drizzle with olive oil and maple syrup. Toss with hands to coat. Arrange squash slices on prepared baking sheet. They should all fit on one pan. Pour any remaining oil/syrup from the bowl over the squash. Sprinkle with salt. Roast for 15-20 minutes, until squash is tender and browned on top. Rinse seeds and separate from stringy flesh. Place seeds in a small saucepan and cover with cold water. Add salt to water and bring to a boil. Reduce heat and simmer for 5-6 minutes. Drain. Let seeds dry for a few moments. Place in bowl and toss with coconut oil. Spread on a baking sheet and broil for 3-4 minutes (time varies depending on the strength of your broiler). Cook until seeds start to brown and pop. Remove and allow to cool. Eat plain or use as garnish for blended soups.